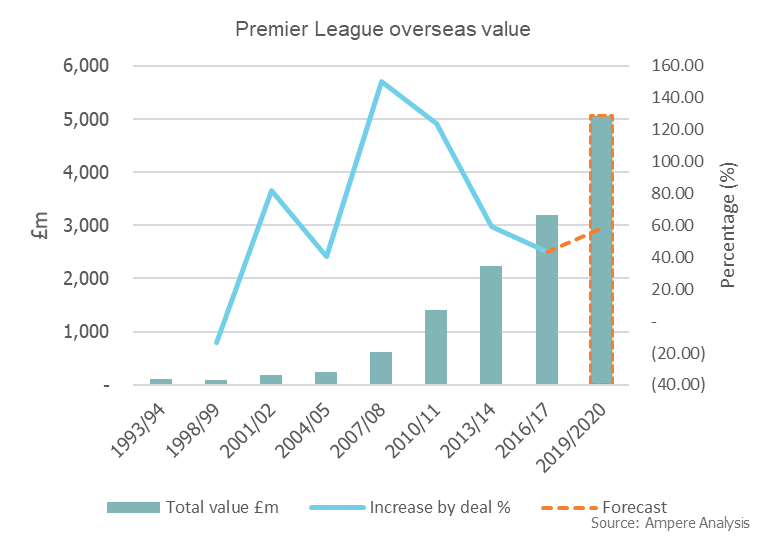 The value of Premier League football rights is set to break the £10 billion barrier for the first time, with Amazon emerging as a “significant potential bidder”, according to Ampere Analysis. The research firm predicts that the total value for UK and international rights in the upcoming auction for three seasons from 2019 – 2022 will reach £10.9 billion – up from £7.37 billion in the previous auction. Domestically Ampere predicts live rights will go for between £5.6 billion and £5.9 billion, marking an inflation rate of 9% and 15%. It said the international rights value could increase by 58% to reach £5.05bn. Sky and BT will remain “strong and viable bidders” and are unlikely to pull back on spend to the point where there is a decrease in absolute value of the Premier League, according to the predictions. Ampere said its ‘most likely scenario’ is that Sky takes four or five of the seven rights packages of 200 live games that are up for grabs, BT takes an additional two or three, while a third bidder – potentially Amazon or Liberty Global – takes one or two packages. According to the predictions report, Amazon represents a “significant potential bidder for international rights”, and its involvement as a bidder could be a key factor in inflating international rights this time around. However, it also said that any Amazon bid for UK rights would be limited to one of the smaller packages to “test the water this time around”. Liberty Global, which owns Virgin Media in the UK, was cited as another possible new bidder having shown an increasing appetite for direct control of content in recent years, including Formula One rights. “Unlike the bidding for the 2017 to 2019 rights, life is now very much less certain. What has changed is the very real threat that Amazon will look to take at least some of the UK and later on, international rights,” said Guy Bisson, Research Director at Ampere Analysis. Sky and BT’s business rationales have both changed since the previous auction, with margin pressure and the difficulty of justifying sport spend to cross-sell broadband meaning each is competing on the same terms, according to the research. The Ampere report made no mention of Facebook, which is said to have appointed Eurosport CEO Peter Hutton earlier this week as it looks to secure live sports rights. According to reports, Hutton will move to the social network after the 2018 Winter Olympics, which will take place in Pyeongchang, South Korea next month.